We are fully accredited with the Better Business Bureau. We can remove a tree like the one above in just a couple hours. If you have a situation like the lady above please call us. We can remove your storm damaged or uprooted tree quickly and make a temporary roof repair if needed most likely by evening! Your homeowners insurance should pay for all the damage including the removal of your tree less your deductible. We will gladly work directly with your insurance agent or your insurance adjuster to help you settle your claim. 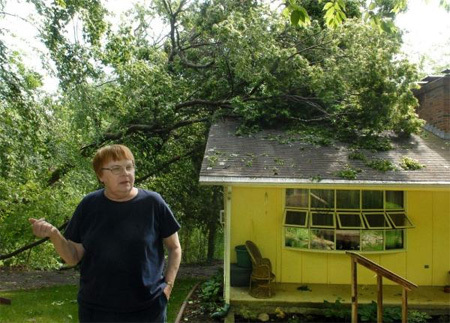 Your insurance may also pay you for the value of your storm uprooted or broken tree (trees do have a value). Your insurance may also pay to replant a new tree. We also plant large replacement trees! We will gladly do the research to help you get your full coverage for your loss.